I’ve wanted ice boots for Simon for a long time. I feel like it’s important to do everything reasonably in my power to keep my horse sound and happy for as long as I can. To me, icing after jumping & hard rides on the front tendons is a pretty solid idea. Will this prohibit him from ever breaking? No. Will it help a little bit? I think so. So with a Christmas gift card in tow, I ordered the Cool Boots from Dover Saddlery. I’ve tried them now three times, and am completely underwhelmed. The good news is that Dover stands by their products, and will let me return the used boots. In the product image, the boots seem pretty thick and fluffing with freezable gel. When I opened the package, they are actually only about .5″ thick and pretty stiff. They are straight rectangles and can be used on either leg. 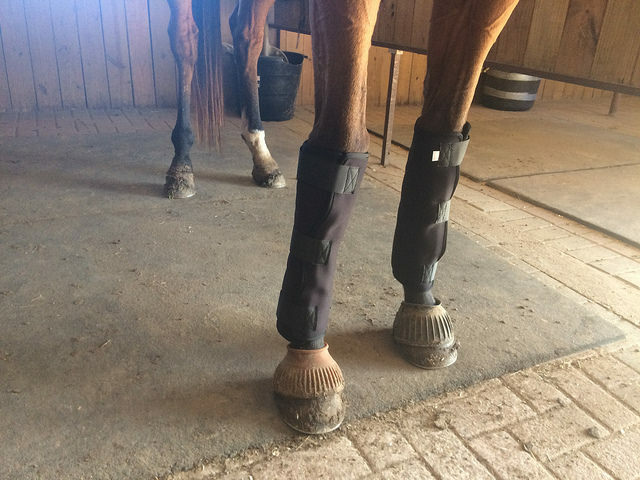 This is good, because they’re long enough to cover some knee and ankle or be used on hind. This is also not good, because they’re really hard to get on. The velcro wants to attach itself to everywhere else, and because they have 0 shape you have to fight to get them tight on your horse’s leg. The third time I used these, I wrapped them around as TIGHT as I felt like was safe. After 15 minutes, they only got the back of his cannon bone, the top of his knee, and the outsides of his ankles cold. All those tendons in the front I’m concerned about? Still warm for our ride. To be fair, my friend suggested that I wet his legs down first and then try them. I gave up before then, so maybe they work a lot better with wet legs? Not a product I would recommend. I want to return these for different ice boots, but don’t know what to get. Any suggestions for me? As an eventer who has tried many of the icing gadgets out there, I will say that nothing beats actual ice on their legs. Jack’s boots work great and are very affordable, and one bag of ice is usually plenty for both legs. I have an Ice Horse machine that I picked up for a song, and while it works extremely well now that I’ve figured out how to use it properly, they are definitely up there price wise. Sadly most of the “ice pack” type boots/wraps I’ve found to not work well at all. The hunter/jumper barn I worked at used a Game Ready machine on some of the horses after hard work. The Game ready has wraps that look like big shipping boots to go around the legs and then attach to hoses that attach to the machine. You fill the machine with mostly ice and some water and the Game Ready pumps the cold water to the boots and the boots compress on the legs with cold pressure I’m fairly certain it was a really expensive machine but sometimes I felt like it had the same problems you did where some areas of the leg were still warm. I’ve been drooling over the Ice Vibe boots for awhile now. I haven’t tried them yet but I like the concept of the boot providing cooling and massage to the leg. 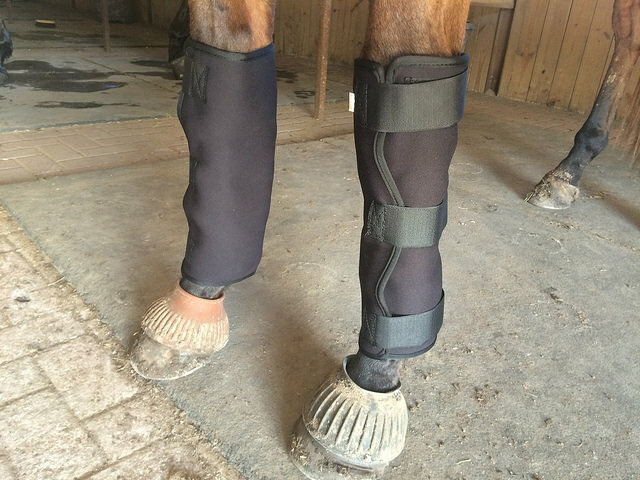 The only con is that they only cover the cannon bones and you have to buy additional boots for knees and fetlocks. Imho Ice Vibes are definitely not worth the money. I bought a set, used them 4 times, was horribly unimpressed, so I sold them. The ice packs were so thin they only stayed cold for 10 or 15 mins max in the boots, and if you didn’t take them off immediately, they would just sit there and warm up. I had the same issue with them not contacting around the leg properly as well. I honestly never remembered to use just the vibration before I rode either. Good to know, I’ve never known anyone who has had them. Thanks for sharing, guess I’ll save my $200+ and get some gel ice packs and an extra set of standing bandages like Courtney suggested! 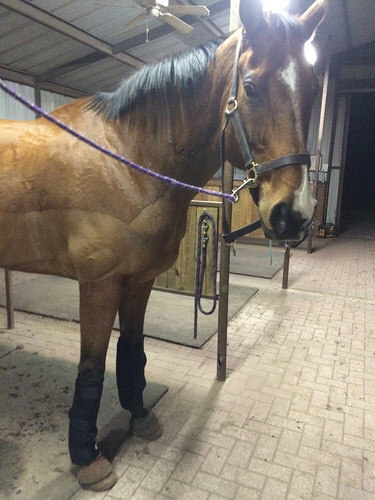 I have loved every Ice Horse product I have tried (tendon wrap, back blanket, and the barn’s hoof boot). They at some point updated their gel in the ice packs between my tendon boot and the back blanket and they are improved (not that I was unhappy with them before, but they are more flexible). In any case when you are using ice packs they will work better when the horse is wet, but I still notice cooling without doing that. I would highly recommend their products. If you wanted to try to be cheap you could buy their packs and polo wrap them on too. I can say though, I religiously use my BOT wraps on barrel horses and I can really tell a difference after using them from before I started. That’s sad 🙁 I’ve never been much into icing, but maybe I would if I found a product that made it easier. That looks really interesting! Something to check out for the future I think. Coldflex. http://www.coldflexequine.com/. I have felt this stuff and if I needed regular icing/ cold therapy would use it on myself in a heartbeat. I use ice packs and cottons, I never place them directly on. Be careful not to leave them on too long though, because they heat up once they have cooled completely. For anyone following along, I ended up getting Professional’s Choice ice cells made for horse’s. Going to wrap them with a standing wrap… and they’re $22 for two! Keep us posted on how they work! I haven’t had much luck with ice boots either. Great to be able to read everyone else’s experiences. I’ll be out at the barn tomorrow morning and can show the the ones I have. I got some that have ice and ability to do intermittent pressure. I don’t know whether it really helps to ice, but they are easy to put on and seem to stay put. sorry these didn’t work out for you! tho i like the other comments that recommend wrapping actual ice packs using more traditional wraps… good luck! I’ve never iced my horses legs, but a freind of mine had a horse with horrible lower legs and she was always trying to mitigate lameness and had these weird blue ice tape thingies. Apparently they were amazing and conformed nicely & held the cooling effect. Might look into that? Or just straight ice with polos wraps as others suggested! I’ve iced a lot of horses and always have great luck with the old stand by 9 pocket ice boots. They cover from knee to ankle and get the whole leg freaking cold. Fill each pocket with ice then hold against a wall and crush and then wrangle onto leg. Every 10 minutes so you have to pull them up and tighten the Velcro as the ice melts. A total pain, but it totally works. We used GameReady at the big shows and I love it and would swear by it – except it’s outrageously expensive. Maybe not so bad for a trainer to buy for their entire barn, but independently pretty impossible. Last summer we picked up a pair of Ice Vibes for a horse in the barn with chronic lymphangitis and so far we’ve been really happy with them for him. They really seem to help head off a bad flare up. Check them out. Good luck with the cells, I did like them but find they warm up too fast and are clunky to get on properly.